It is rare to be moved so much by the death of someone you did not know, Monsieur Salut writes. Keith Charlton’s passing has had that effect. I am sure lots of others who didn’t know him personally will look at the photographs of Keith, the first secretary of the SAFCSA Boldon branch and a member for 23 years, and recognise a man they saw at games home and away. * SAFC Fans’ Museum: devasted to announce the loss of a true devoted friend and fan. Keith will never ever be forgotten, and for many reasons why. A man who had day to day struggles but never expressed that. All I will say, a brave man, a true fan and a gentleman. Rest In Peace Keith, I’m proud to say you are and will ever be a part of the Fans’ Museum. * Rob Gilchrist: I have just returned from the office and switched on my laptop to receive an e-mail that has truly, TRULY knocked me for six and totally devastated me. I have been informed that a very, very loyal and beautiful person in my life Keith Charlton has passed away very suddenly. Like many others Keith was more than a loyal supporter of our beloved Sunderland AFC, he was EVERYTHING to Sunderland AFC. The club really was his whole life from top to bottom. As a club we don’t do European competition but whenever our club did a pre-season whether in the UK, Europe, America or Asia, Keith would be there. He truly was a supporter to the very core. Keith was part of several Supportes’ Groups like myself and always played a valuable part in all discussions with SAFC staff past and present and was extremely popular amongst many of our colleagues within SAFCSA, Fans’ Liason Group and the Branch Liason Council. Keith also was a safety steward at the club for a long time and it was a position he was extremely proud of and latterly played a fundamental part in assisting another good friend of ours Michael Ganley in the creation of the Sunderland AFC Museum and played an active part in its running and displays at various locations. I am speaking now as his friend. Keith absolutely idolised me [and me him] for over two decades and I was delighted and honoured to provide personal references for Keith on a number of occasions… whenever we met there was always a warm handshake before and after. 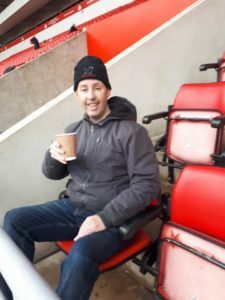 I last saw Keith inside our stadium on November 17th before the Wycombe game and when we parted I said I would either see him at Walsall on the 24th or inside the ground last night before Barnsley. Some of my personal friends on Facebook will have seen Keith always respond to my posts wishing everyone a happy weekend saying he hoped SAFC wouldn’t spoil it. Keith truly was a beautiful person and friend and I am in bits as I write this. Our deepest thoughts and sympathies go with his parents, his sister and their family as they come to terms with their collective grief. Heaven has truly gained an angel and there is a star which is shining brighter than most tonight. That star is Keith Charlton from Boldon. REST IN PEACE MY BEAUTIFUL AND LOYAL FRIEND. I WILL MAKE SURE YOU ARE NEVER FORGOTTEN BY ALL THOSE WHO KNEW US. 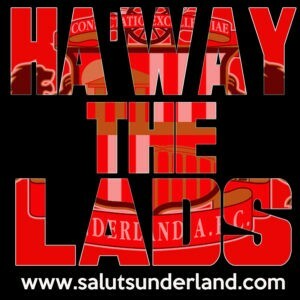 KEITH CHARLTON………..TRULY SUNDERLAND TILL HE DIED. * Paul Summerside: I would like to join Rob in an appreciation and celebration of Keith’s life. He was a great lad, a wickedly dry sense of humour, and the most loyal and knowledgeable SAFC fan I’ve ever known. He will be missed by all SAFC fans, all at the Fans’ Museum, and everyone who was lucky enough to meet him. I am truly gutted. God bless you Keith Charlton. Party as a Werewolf … he will be sorely missed and all the comments I’ve seen from former and current players and friends and family reaffirm that. Keep the faith Keith. * Andrew Stuart Neil: I am totally devastated about Keith have so many memories of working with Keith at the fans’ musuem. Partner in crime. He was a great guy. Tags: Keith Charlton, Sunderland A.F.C. A fitting tribute to a special person. Thanks Monsieur Salut. A proper fan, who followed and supported his team through thick and thin. A good round of applause for Keith on 45 mind yesterday. Walsall fans wondered what it was all about.